The river is flowing at 24Cfs, and is 55 F. The river should be low and clear for sometime as Prettyboy Reservoir is given a chance to recharge. We saw many flyfisherman from the Northern Virginia and DC area taking advantadge of low flows and great Fall Flyfishing weather this past weekend. Most of the catches over the weekend were on brassies, small midge larvae patterns and small streamers. Falls RD through Masemore RD access points were red hot hot but with lower flows forecast through the week, it would be prudent to seek out fish below the confluence of Little Falls at Bluemount RD downstream through Monkton RD. Thanks to Craig for the following stream report. I just wanted to let you guys know I appreciate the complete and accurate updates on stream and fishing conditions on your website. I drive up from Dulles so it’s nice to know ahead of time what’s happening. This entry was posted in fishing report on October 29, 2007 by Theaux Le Gardeur. After a signifigant storm, the promise of great trout fishing is alive and well on the Gunpowder river. Where can one fly fish in the Mid-Atlantic after 5″ of rainfall? The Gunpowder river of course. 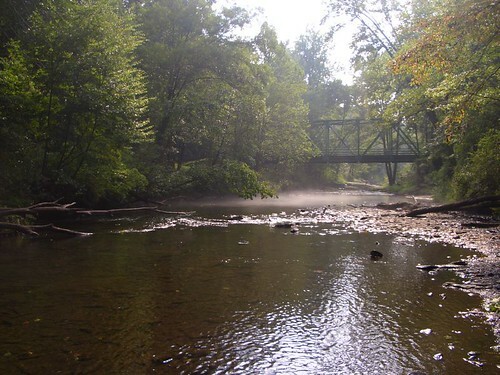 While most locales received between 5.01 and 5.6 inches of rainfall in the past twenty four hours, the Gunpowder river is low and clear from Masemore RD upstream through the Falls RD stretch to PrettyBoy Dam and is flowing at 80Cfs. Olives, caddis and small bead head nymphs have been very productive this week. Small streamers, including Lite-Bright Zonkers are also worth a shot. This entry was posted in fishing report on October 27, 2007 by Theaux Le Gardeur. The shocking survey on the Gunpowder River is pretty incredible to witness. On September 24th a team of Maryland Department of Natural Resources Fisheries Biologists shocked the Falls Rd area on Gunpowder River. A line of wader clad, net wielding biologists and volunteers pushed upstream behind biologists wearing electro-fishing backpacks. The shocking prod stunned anything within a five to six foot range with a low volt charge. The stunned trout floated to the surface where they were gently netted and placed in buckets. Trout and the occasional big sucker floated up from every little hole. The contents of the buckets were placed into tubs with meshed out bottoms to allow water to flow through. The area sampled was over a hundred feet long and was comprised of shallow riffles. During the survey, seven to ten tubs lined the shoreline each filled with 75 ten inch adult brown trout, and many smaller and young of year trout. In this video short, the trout in these tubs were anesthetized with a quick acting liquid solution that allowed the biologists to handle and release the fish with minimal injuries to the fish. Once the trout were sedated each trout was measured, weighed and looked over for hooking injuries. Many of the trout sampled did show signs of being hooked and safely released many times. After the trout recovered in a fresh water bucket, they were placed into the tubs in the river to recover and then released. The Gunpowder has such a high density of wild trout that most anglers wouldn’t believe the results of the shocking survey, unless they saw it with their own eyes. In recent years the survey has uncovered browns over twenty inches and up to four pounds, but not this year. Although three fish in that size range were caught and documented on film by Backwater Angler Guides this Summer. Jeff Lewatowski’s big brown was caught one day after shocking surveys ended and was landed within earshot of where I video taped the survey. Big fish can make your day or even year, but the Gunpowder does not give up big fish easily. 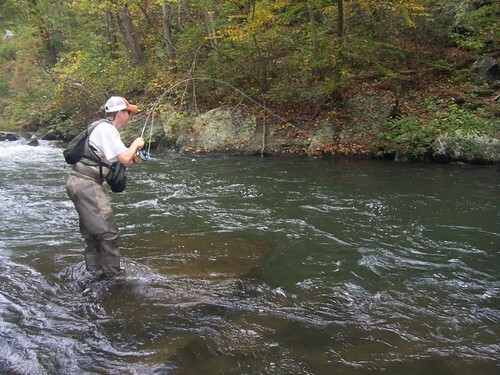 It does yield more wild trout than any river in Maryland, and its density of trout can allow skilled anglers the chance to catch dozens of feisty, beautiful trout in one outing. 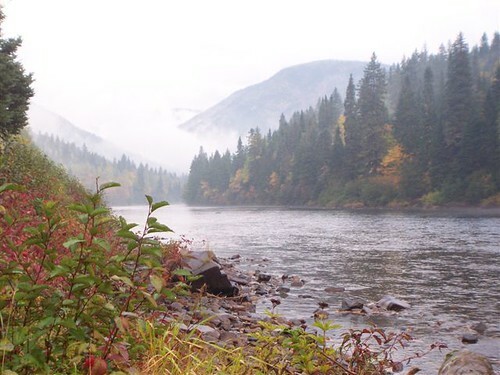 Once you become proficient on the river and resign yourself to catching these often acrobatic nine to twelve inch browns trip after trip, the big trout may start hunting you. This entry was posted in news, video on October 23, 2007 by Jason du Pont. Gunpowder regulars Pam and Fred Meier had their hands full on a recent first time Atlantic Salmon trip to the Grand Cascapedia. The scenery and fishing looks nothing short of spectacular. Thanks to Fred and Pam for the pictures and accompanying fishing report from the Grand Cascapedia. may one day swim in the Grand Cascapedia. P.S. The Winston rod was purchased at On The Fly almost 12 years ago by my former colleagues as a retirement gift. It has only been used twice in the intervening period. In combination with the Bauer reel your sold me early this year, it was excellent for salmon fishing- better than the 9 and 10 wts that the other guests at Tracadie were using. For those interested in flyfishing tackle, gear and techniques for Atlantic Salmon in New Brunswick and Quebec, members of our shop staff have been lucky enough to flyfish the Restigouche and Matapedia over the years and would welcome any opportuntity to talk about flyfishing for Salmo salar, “the leaper.” Here is a last look at Fred’s 38lb Atlantic Salmon from the Grand Cascapedia before the release. This entry was posted in fishing report on October 23, 2007 by Theaux Le Gardeur. Thanks to Gunpowder regular Terry Newendorp for the following gear review on the Thomas & Thomas Horizon II 9ft 8wt 4pc fly rod. I’m down at my place in Florida and went snook/redfish fishing yesterday with that T&T H II you sold me a few months back. It was the second time I fished it, but the first time in wind and for 8 straight hours in the flats and mangrove swamps. It was nothing less than fantastic: I put unweighted flies right on the nose of fish 70 ft away, weighted crab and shrimp flies right in front of tailing redfish at 60 feet (right on the money, 9 times out of 10), and heavy tarpon flies (yes, we did that too) out there 60 feet into the wind – and never broke a sweat (or wore out my arm). Even the guide (an Orvis guy, through and through) raved about my rod and my precision with it – and that was only the second time I ever had it in a fishing situation! Thanks! This entry was posted in reviews on October 19, 2007 by Theaux Le Gardeur. The Gunpowder river is dropping today from 299 Cfs and should stabilize in the 180 CFs range through the weekend. The river is slightly off color because the reservoir is “turning over.” Lower water levels mean that those intent on wading can get out and cover more water throughout the catch and release stretch of the Gunpowder river. Small olives, caddis and midges have been coming off between Masemore through the Falls Rd stretch. Longer, finer leaders will once again be necessary to trick these wild fish with smaller patterns so start in the 9ft to 12ft 5x range and a some 6x, especially with the midges. We’ve had an excellent stretch of fly fishing during recent high flows as witnessed by the following stream report and photos submitted by Philadelphia area fly fisherman Tom Buterbaugh. 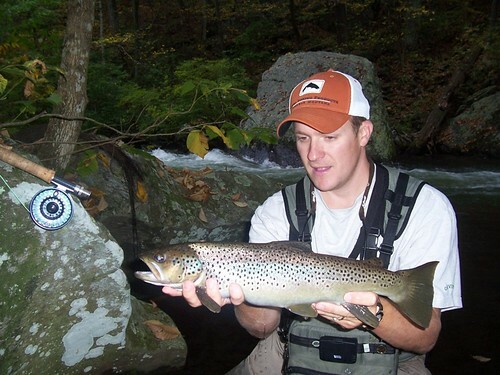 On his first visit to the Gunpowder Tom struck gold in the form of a 20″ wild brown. Mike and I arrived at the Falls Road access about 8am and hiked it in about 3/4 mile. The water looked too good to keep walking… With flows about 230 cfs we started nymphing with a Pheasant Tail/Serendipity tandem. Things started slow and then I picked up a nice 12″ brown on the PT. I caught two other smaller browns and lost one by 10am. Then I hooked what I knew right away was a good fish. The 20″ brown took me down stream about 50 yards before I could land it. What a great stretch of water. This was my first trip to the area, but definitely not my last! 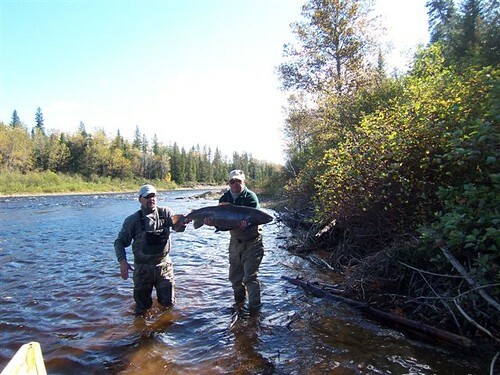 This entry was posted in fishing report on October 18, 2007 by Theaux Le Gardeur. 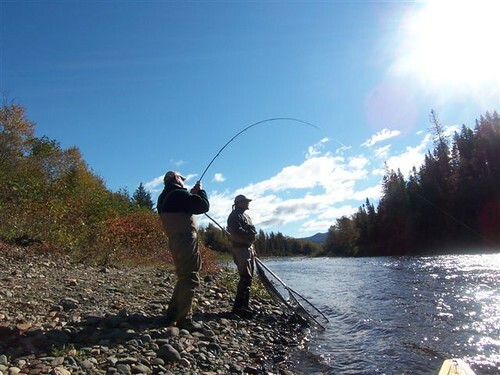 For those of you that would like to spend a few hours afterwork on Thursday, October 18, talking about bamboo fly rods, Dean Turner and Bill Felter will be in the shop from 6:00 till 8:00 to discuss the finer points of building, fishing and caring for bamboo fly rods. This entry was posted in events on October 16, 2007 by Theaux Le Gardeur. This video post features two large Gunpowder brown trout caught in the last week of September 2007. Angler Matt Devlin landed his seventeen inch brown on a tiny nymph in higher water and Gunpowder Guide Jeff Lewatowski landed a solid twenty inch brown on a small nymph during a lower flow. The flow level at 300 Cfs can be tough wading for anglers not used to battling waist high water. Many anglers are foregoing fishing due to the belief the water is too high, but recent guide trips have accounted for first time anglers landing ten to fifteen trout. Dry fly enthusiasts may be disappointed, but nymph fishermen can expect to see some of the best fishing right now. A wide assortment of nymphs are working, but the main hurdles to overcome are using a lot of weight, and rigging the indicator the appropriate distance from the flies. The best way to locate where trout are holding is finding large current breaks, such as logjams, rocks or the insides of bend pools. The trout are not always holding in the calm edges, but many are favoring the tail out areas below rougher water. Using three to four split shot or large balls of weighted putty helps bounce the nymphs off the bottom, where fish are holding. The Gunpowder may seem foreign to regulars at this high level, but it has become a streamer fishermen’s paradise. Five and six weight rods, large zonkers and 3X-4X tippet are recommended for chasing big browns. Various colors and retrieve styles have been working, but one important tip: Fish the streamer in slower moving water where the trout have a chance to grab the fly. The current flows may continue into next week or longer, but anglers should expect to see levels drop significantly once Loch Raven Reservoir is filled. The leaves are already turning in the Gunpowder Falls State Park, the wild browns are biting and there is more cold water flowing down the Gunpowder than many of Maryland’s major river’s combined. This entry was posted in fishing report, video on October 15, 2007 by Jason du Pont.